At first glance, I saw these as possible tacky plastic vases that nobody would ever actually buy. People want fancy glass vases....or their kids' handmade clay vases, right? The fact that they're collapsible caught my attention, but still, they're just plastic, and I thought they'd probably be unstable while actually holding water and flowers, which is the last thing you want of a large container of liquid. I was wrong. These things are so cool! Fill one with hot water to turn into a shape-able piece and when you have it how you want it, just refill with cold water and it becomes hard again, "freezing" it into shape. When you're done, run in hot water again and you can flatten for easy storage. What's even better is that these aren't very expensive either. They're 7 bucks (cheaper if you buy more), and would be great for your seasonal flower displays. These look like fun. The green ones have already sold out. Tacky plastic is great in houses where you have little kids running around and oops--there goes another broken glass. Sigh. Lol, yeah. Well this is plastic and I suppose still "tacky," but at least it's cool and fun to play with! That is really neat! I'd hate to think what would happen in the hot atmosphere where I live though. If I left it in the window it would probably go pliable again and spill out all the water. Ugh, true. That could be a real hassle. I wonder the temperature it actually starts reacting to, though. Wow! 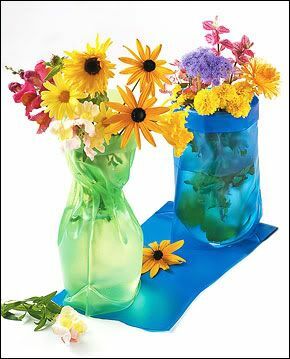 It's fantastic flowers vase.